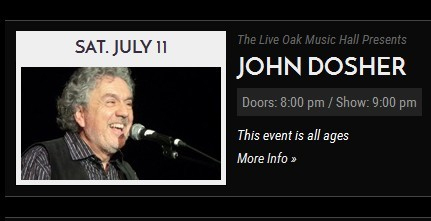 For more information about John Dosher and his music or to purchase tickets click on the image at the left. The Arlington Community Band and the Trinity United Methodist Church Chancel Choir will present a free patriotic music concert that is open to the public. The Arlington Community Band is directed by Rick Baker. Dub Shepherd, Minister of Worship and Fine Arts will be leading the Trinity United Methodist Church Chancel Choir. Attention all artists: There is still time to enter the Star of Texas Public Art Project. 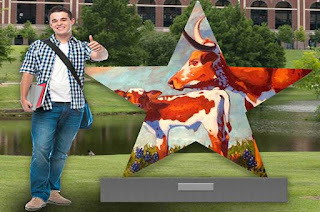 The Arlington Museum of Art (AMA), along with the Arlington Tomorrow Foundation (ATF) and Women Inspiring Philanthropy (WIP) are currently working on the public art project, The Star of Texas. Entertainment District. The sculptures will be individual pieces of art, celebrating the city's new brand, Arlington: The American Dream City. Artists will be invited to submit their interpretation of how they will paint the sculptures to reflect the American Dream in Arlington. A selection committee made up of community members will pick the final twenty artists to participate in the exhibit. 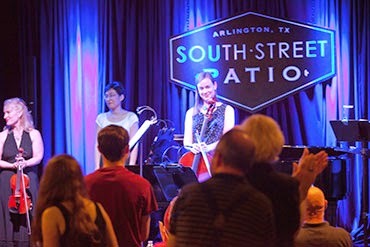 This is an exciting way to have your artwork put on display for the public to see, and to be a part of project to further the arts and culture in the City of Arlington and the Great State of Texas. The final deadline is June 30, 2015. Complete details including how to enter can be found here. Mark your calendars for a night of great music, June 26, 2015. Johnny D and the Doowopps will be at Tierra Verde Golf Club in Southwest Arlington for a "Party On the Patio" concert. The summer concert series features live music by local Dallas / Fort Worth bands. Bring your blankets or lawn chairs for your added comfort. Live music from 7 - 10 PM. Ventana Grille burger bar and cash bar available for purchase. For more information about Party on the Patio call Tierra Verde Golf Club at 817.478.8500. 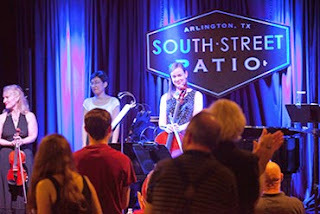 INSTRUMENTALISTS: Violinist LeeAnne Chenoweth, cellist Karen Maddox Smith, pianist Heejung Kang. Listen to the beauty and joy in the music of young Ola Gjeilo, from Norway, who attended the Juilliard School in New York City, and decided to remain in New York. Only in his 30s, he has become an award winning composer, sought after for his beautiful creations for choir and orchestra as well as jazz compositions for small instrumental groups. Also, enjoy music by Romantic Era composers from Norway; Grieg and Sinding. The instrumentalists of Timeless Concerts will accompany tenor Don O’Neal LeBlanc on his choice of solos. The hour-long concert is followed by a party when pianist/vocalist Steve Stroud will take your requests for dancing, or just listening. Table seating for 2 or up to 8. Doors open 7:30, concert at 8:00. Complimentary fruit/cheese/desserts buffet provided by J. Gilligan’s. Cash bar available with mixed drinks plus wine and soft drinks. Casual dress. TICKETS: $29 general, $25 seniors 60+, $15 college students. Youth ages 11-17 may attend free with one paying adult. Make your reservations on the Timeless Concerts' website or call 817-303-4189.